You must watch this video! Artist Johannes Stötter just came out with another incredible bodypainting. 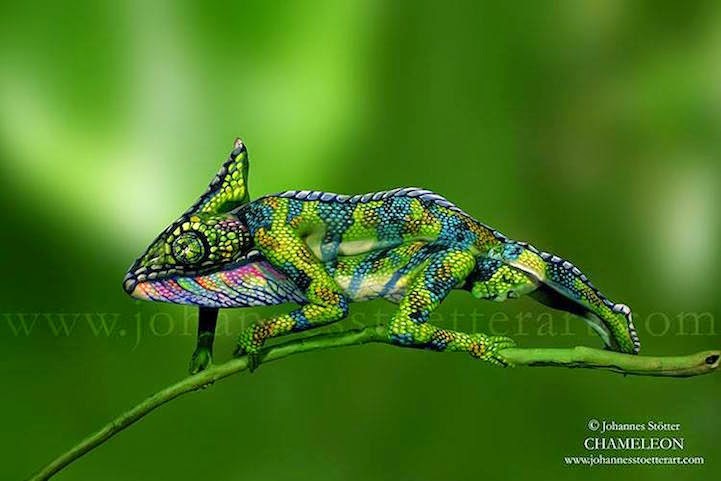 This human chameleon consists of, not just one person, but two people lying on top of each other. While it's easy to spot the first woman, the second one will leave you scratching your head. Stötter worked for four hours to design the piece and the bodypainting took six hours with the help of an assistant. The models' hair were covered in natural clay to make their heads appear bald. "The models were two sisters, friends of mine," he said. "They were very happy to model for this motive. I am also very happy, it is kind of magic, especially the colors.